Life Products™ 1-GP line of products utilize patented stabilization technology to deliver our five research proven bacteria to all sectors of the poultry industry. 1-GP has been shown to improve the performance and health of the birds along with aiding in decreasing the challenges of detrimental bacteria. We offer 1-GP in three diverse forms that will meet your feed management system. 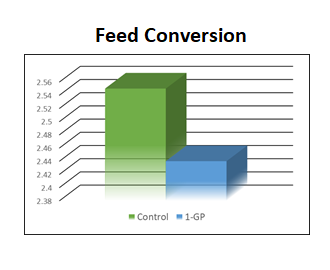 1-GP Dry is ideal for all non-pelleted feeds. 1-GP Liquid uses an applicator to spray a stable form onto feed post-pelleting. 1-GP Hydro is a water soluble form that can be administered through the drinking water using a medicator. 1-GP offers a way to improve gut health and performance without the use of antibiotics. 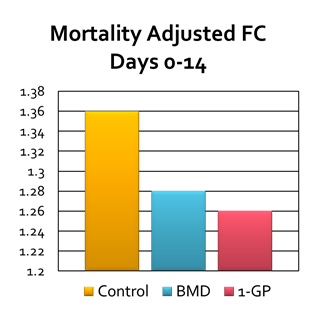 In a 49-day study conducted by Texas A&M University, 1-GP performed as well as a traditional growth promoter when evaluated for feed conversion, livability, feed intake and weight gain. Healthier hens come into lay earlier and produce more eggs than those that may be sub-clinically challenged. 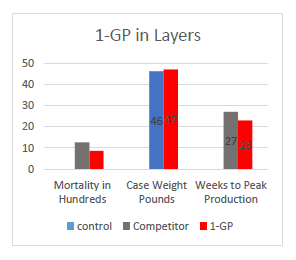 Research shows flocks fed 1-GP achieved peak lay (90% or better) 4 weeks earlier than those fed a leading competitive product. 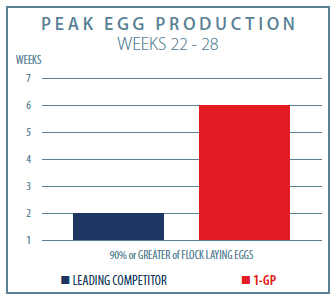 Hens fed 1-GP also had increased egg production (2-8 eggs/hen) throughout the entire lay cycle. 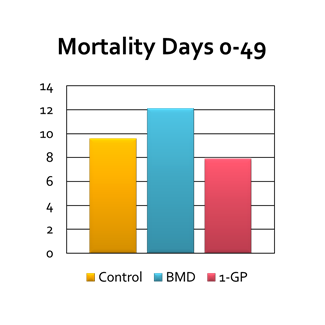 Additionally, during a 4-week period, hens were fed 1-GP for the first 3 weeks. In week 2, the pathogenic E. coli level was less than 100 cfu/g in all six samples taken. In week 4 (one week after 1-GP was removed from diet) the levels of pathogenic E. coli had a range of 1,000,000 cfu/g to 140,000,000 cfu/g in the six-sample results. With improved gut health and performance without the use of antibiotics, Life Products™ 1-GP technology delivers the proven advantage of beneficial bacteria to the Turkey Industry. 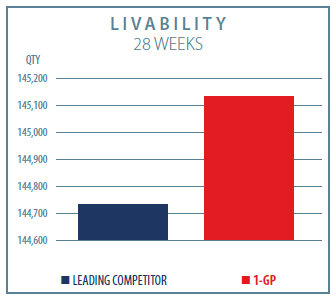 As the data from the Antibiotic-Free Midwest Turkey Trial shows, 1-GP improves feed conversion, livability and feed costs without sacrificing weight gain, thus promoting increased production and profitability. 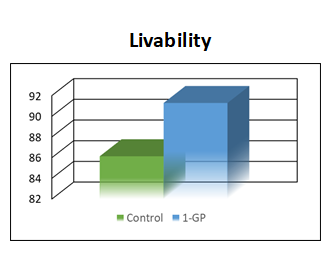 Grow-out flocks were composed of hybrid, antibiotic-free birds evenly divided between Control and 1-GP treatment. Control processed at 134 days. 1-GP processed at 133 days. 1-GP Small Flock: Life Products™ research proven poultry probiotics, combined with patented stabilization technology, conveniently packaged to help bring viable probiotics to all flock sizes. 1-GP Small Flock can be added to or top dressed onto the birds feed on a daily basis ensuring your birds can perform to their optimum ability. 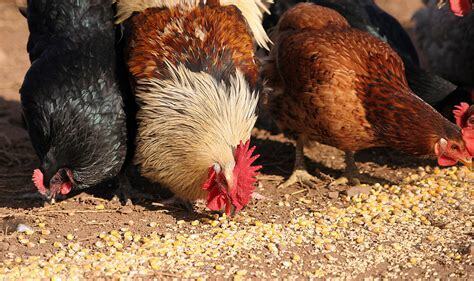 1-GP Small Flock has been shown to improve the performance and health of the birds along with aiding in decreasing the challenges of detrimental bacteria. Life Products probiotics, in a concentrated liquid form, applied to feeds utilizing our exclusive, patented delivery equimpment. 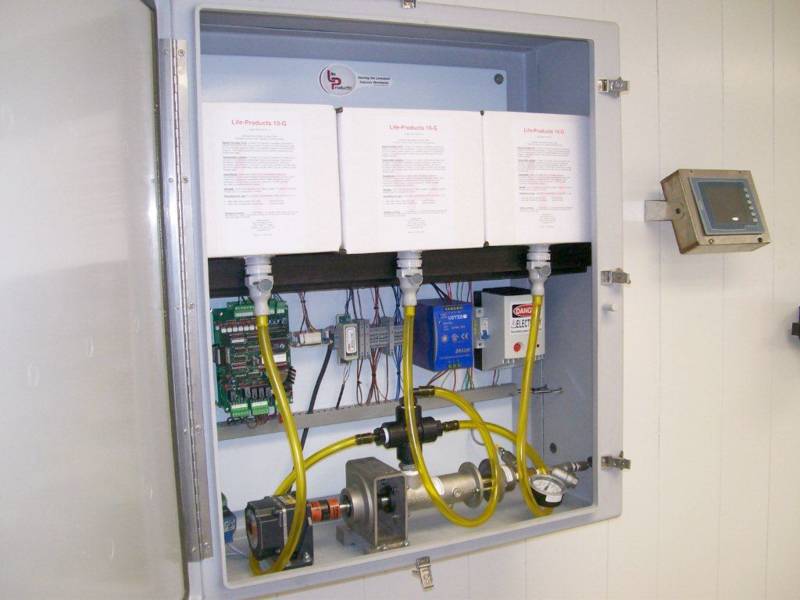 Compact and automated, this application equipment can be installed in most mills or manufacturing facilities in a short amount of time. Contact us for more information on these products and equipment.